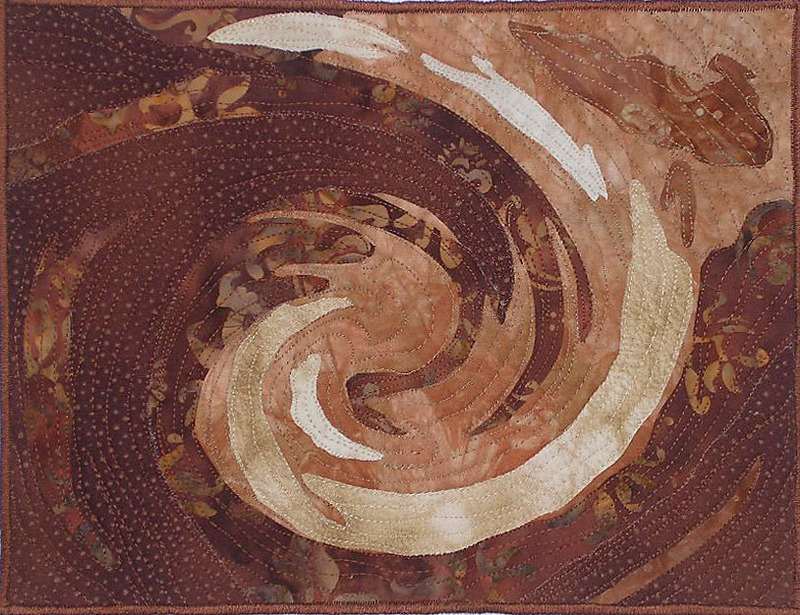 Did I ever show you this small quilt I did in a mini group quilt challenge years ago? The theme was "coffee and cream" and this was my response. (The mini-group preceded 12x12, and was short lived because the 6 of us lived too far apart and getting together was just too inconvenient.) Anyway, this came to mind because I was thinking about how bad I feel about not posting here, and how totally uninspired I've felt in terms of creating art, and how I've been relying on coffee a lot for energy during a period when I've been feeling rather dull. The dullness, as you know from our emails, comes I think from this time of big emotional processing. And, I think, my creative impulses have been consumed in other areas -- changing some things in the house, figuring out garden and decor plans, etc. But I have the double-edged sword of an impending deadline. 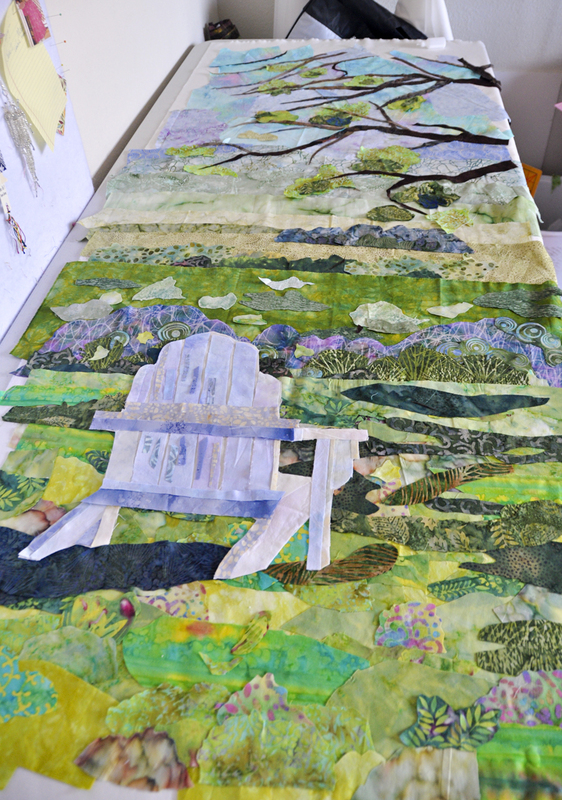 Some months ago I agreed to submit a piece to a quilt exhibit and the deadline is approaching. The bad news is that I don't feel like doing anything at all. 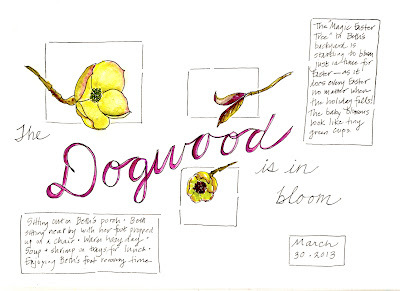 The good news is that this deadline is pushing me to do something despite my case of the Art Blahs. So I have been pushing ahead and I know I will be glad to have done this. But what I really wanted to talk about here was the subject of sketching. I knw you have been sketching a lot while on your vacation in Bath, and I'm interested to hear how, after that week has ended, how you've felt it went. Did you enjoy it? Did you find that your process, or your approach to it, changed over the week as you did more? It reminded me that I've got lots of issues to improve on (not the least of which is my tendency to overwork things) but it was very fun. 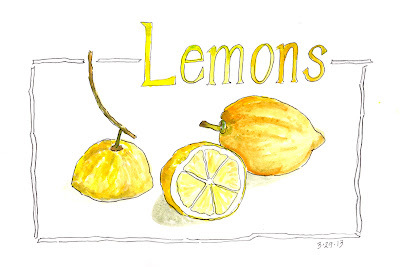 Looking at it now brings me right back to the porch where I was sitting, the scent of the sliced lemon, the feel of the springy breeze... It was a very nice hour. 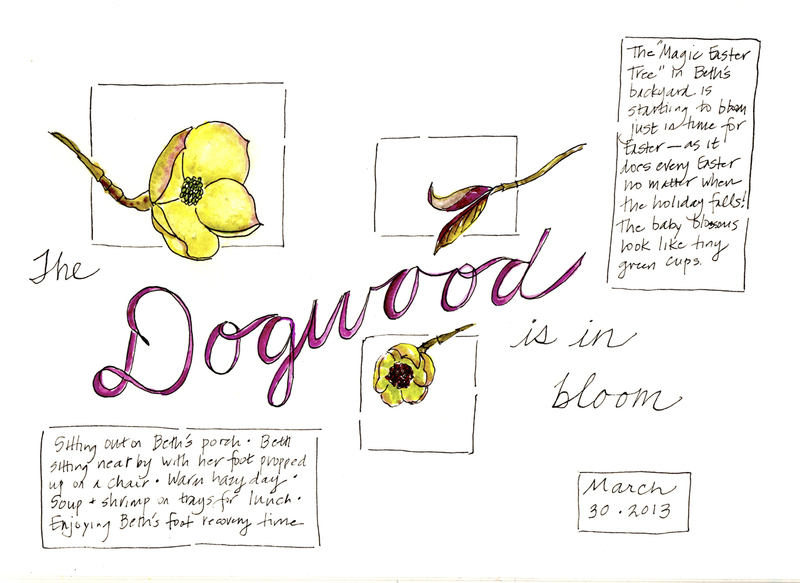 I took a stab at painting some dogwood blossoms from a tree blooming in my friend's backyard. The individual sketches aren't horrible, although I did even worse in the over-working problem. And then I thought I'd try to unify things on the page, and got to this point, which clearly needs more to pull this together. I'd call this Not a Success. Still, it was enjoyable doing it. So I am starting off April with the goal of getting back to sketching more regularly -- twice a week, at least, is my goal for the month. It has made me think again of putting a small table in the family room for sketching while I listen to/watch tv in the evenings. Hmmmm.